Bicycle messengers braved showers of rain and cheap beer in Chicago last weekend during the 2012 edition of the Cycle Messenger World Championships. 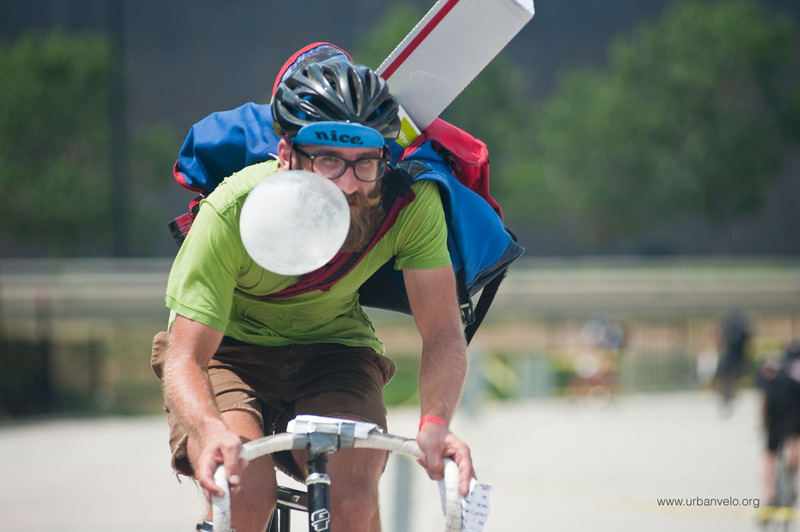 The contest was held outside Soldier Field and featured bike messengers from around the world competing to be the best. My law firm was a proud sponsor. Unlike a traditional bike race in which the idea is basically just go fast, the main event of the CMWC featured a course that required the type of urban cycling skillz (look, I used a "z") honed by pro bike messengers at work every day. They were required to navigate a confusing, non-circular course, stop at various check points, lock-up so as to avoid having their race rigs swiped by a dude in a hot dog costume (happens daily on the mean streets), and pick-up and drop-off packages. The overall winners of this madness were Craig Etheridge of Seattle on the men's side and Josephine Reitzel of Switzerland, first among the women. Click here to see the full list of race results. Steven Vance, Kevin Gebhardt and others posted loads of great photos of the event on Flickr. You can also gawk at tons more photos on Urban Velo.